Award winning Cake Decorator Karina Leonard is based in Co.Sligo Ireland. With a love of Home-economics and art growing up, it was no surprise sugar craft would become a passion. Although for a long time her working background was book-keeping/accounts this love of art was never far from her mind, & after starting a family that love of sugar craft was re-ignited. (Also helped by moving next door to Lisa from Sugar & Lisa in Jan 2000, “seeing and sampling many of Lisa’s cakes just brought it all back”). A night class in cake decorating was quickly enrolled in, at a local Northampton school. Although “run out work” and “illumination work” were the tutors chosen topics for beginners, Karina a little overwhelmed was undeterred. Returning home to Ireland in 2005, Karina again enrolled in another sugar craft class, thankfully this time “Beginners” meant Beginners. With a young family at the time, birthdays etc were ideal to practice skills on. In turn, in 2006 leading to a friend of a friend booking a first order, & so began “Karina’s Cakes Sligo” initially. In the years since Karina has taken the basics, practiced & expanded them, researched techniques, developing her unique skill, even venturing in to the world of Sugar Craft Competitions (not for the faint heart), click portfolio then Awards to see more. Working from home in her HSE-registered kitchen initially Karina’s Cakes Sligo was started & eventually deciding on a definite business venture Cake Rise was established. In 2014 with the family kitchen no longer suitable to run a small business, Cake Rise became a separate boutique kitchen in Karina’s home. 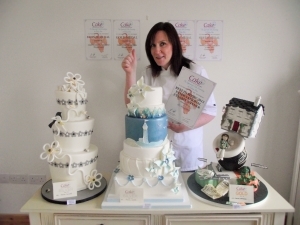 With over 10yrs experience of supplying high end Wedding cakes etc, Karina’s attention to detail & passion for producing beautiful cake creations, centre piece’s for all occasions is constantly complimented by her clients & piers.